Archives of Eaton Bray News for February 2014. This article was published in February 2014. Please see Latest News for more recent information. NOTICE IS HEREBY GIVEN THAT CENTRAL BEDFORDSHIRE COUNCIL, in exercise of its powers under Section 90 A-I of the Highways Act 1980 and all other enabling powers, proposes to construct raised cushions under Section 90 A-I of the Highways Act 1980 and all other enabling powers in High Street, Eaton Bray. 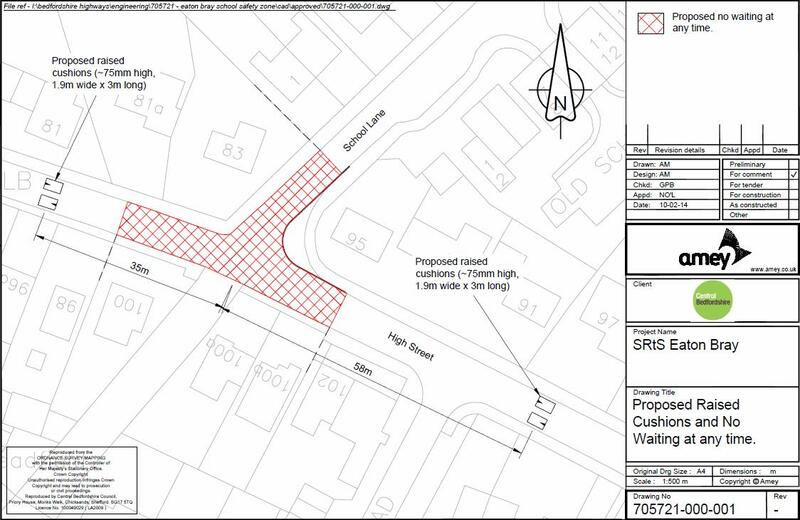 The proposed measures are designed to reduce vehicle speeds and create a safer environment for all road users, including pedestrians travelling to and from Eaton Bray Academy. High Street, at a point approximately 35 metres west of its junction with School Lane. High Street, at a point approximately 58 metres east of its junction with School Lane. Further Details a drawing may be examined during normal opening hours at Dunstable Library, Vernon Place, Dunstable LU5 4HA or online at www.centralbedfordshire.gov.uk/publicstatutorynotices. Comments should be sent in writing to the Transportation Manager, Central Bedfordshire Highways, Woodlands Annexe, Manton Lane, Bedford MK41 7NU or e-mail [email protected] by 14 March 2014. Reason for proposal: The proposed Order is considered necessary for avoiding danger to persons or other traffic using the road and for preserving or improving the amenities of the area through which the road runs. The restrictions are intended to keep the junction of High Street and School Lane clear of parked vehicles, particularly at the start and end of the school day. The proposals are part of a safer routes to school scheme, which is intended to improve road safety near to the school and encourage more pupils to walk to school. Objections: should be sent in writing to Transportation Manager, Central Bedfordshire Highways, Woodlands Annexe, Manton Lane, Bedford MK41 7NU or e-mail [email protected] stating the grounds on which they are made by 14 March 2014. Date and Time: Overnight on the 12th to the 13th February. The location is a new development. The offender has forced open the door to the garage. A search took place, but it is not yet known if any property has been taken. A supicious vehicle has been reported at the location prior to the incident. A White Ford Transit Van, with the registration similar to L S 5 9 K T E. One white male in his 30s and Two white females in their 20s were seen with the vehicle. Crime Reference: J D / 5 6 4 9 / 2014. Keep Doors locked, even when you are in the house. Double lock UPVC doors at all times. Yesterday, as forecast, the UK was hit by the latest wave of severe weather. Heavy winds and rain have resulted in disruption of power supplies across several parts of the country. Wind speeds within UK Power Networks' region, while still severe, were not as extreme as in other parts of the country. The weather did have an impact on our network, but the preparations that we put in place over the last days meant that we have been able to cope with the resultant level of faults and customer calls. Met Office forecasts indicate that the period of severe weather will continue into the weekend hitting UK Power Networks' region tomorrow evening and on Saturday. We therefore continue to work closely with the Met Office to monitor the situation and continue to mobilise the resources in preparation for any future disruptions. A weather warning has been issued for the south coast for the night of 14 February. Wind speeds of 75-80mph are forecast on the coastal parts of our South Eastern network and 65mph for inland areas. The Eastern network is forecast to be hit by winds of up to 70mph on Essex and Suffolk coasts, lowering to 50mph inland. We would like to reiterate the dangers of coming into contact with downed power lines and urge the public to stay well clear. Anyone spotting a damaged power line needs to report it to UK Power Networks immediately. In the South East call 0800 783 8866 or 01243 50 8866 for mobile users and in the East of England call 0800 783 8838 or 01243 50 8838 for mobile users. When our power network is impacted by a storm, our priority is always on restoring electricity to customers as quickly and safely as possible. We have mobilised over 400 overhead linesmen across our Eastern and South Eastern networks. In addition to the above, over 250 scouts and over 70 Customer Information Officers have been confirmed across the business. UK Power Networks' specially trained staff, known as Customer Champions, have also been put on stand-by. We will continue to send you regular updates but please don't hesitate to check our website www.ukpowernetworks.co.uk or follow us on twitter. Over the past two months, Britain has been subjected to some severe weather. We have just had the wettest January in over 200 years and February has continued this trend. The Met Office now forecasts that more severe weather may hit our region this afternoon and persist throughout the rest of the week. UK Power Networks is therefore monitoring the weather extremely closely and maintaining its preparations in readiness for any impact on its network. Today a National Severe Weather Warning has been issued across the whole of England and Wales for gale force winds. For UK Power Networks' regions, the Met Office forecasts wind speeds of 45-55mph in our South East network on the night of 12 February. There may also be gusts of up to 70mph on the coast. These winds are expected to move up to the more exposed areas of our Eastern network with gusts up to 60mph being predicted. The storm is expected to die down in the early hours of the morning of 13 February. A band of heavy rain is also forecast for the afternoon of 12 February, moving eastwards across our networks, with up to 10mm of rainfall predicted. This will give way to more showery conditions by the evening. Further severe weather is then forecast on the morning of 14 February, continuing through to 15 February. Gale force winds and heavy rain are forecast on 15 February, with gusts of up to 75mph expected across our both our Eastern and South Eastern networks. We are in the process of securing extra resources, including linesmen and scouts, to be mobilised for both the Eastern and South Eastern network areas. Calls are being made throughout the business and our contractors to find these extra resources. Later today a conference call between all DNOs will be taking place to discuss the possibility of providing staff to assist in repairing the most affected networks. However, if the storm materialises and is, as currently forecast, a national event, it is likely that the extent of assistance that other DNOs can provide will be limited. UK Power Networks' specially trained staff, known as Customer Champions, have also been put on stand-by. To report any power cuts and damaged lines on free helplines, please refer customers to the following numbers: In the South East call 0800 783 8866 or 01243 50 8866 for mobile users and in the East of England call 0800 783 8838 or 01243 50 8838 for mobile users. You can also see www.ukpowernetworks.co.uk and follow the company on Twitter for updates. UK Power Networks would like to advise you that the predicted weather severity has been downgraded. Despite a more optimistic forecast, UK Power Networks continues to monitor the weather, working closely with the Met Office, and ensuring that adequate preparations are maintained in case the storm hits. The Met Office forecast of wind speeds has lessened for our South East network on the night between 7 February and 8 February, with 50-55mph inland and 55-60mph on the coast. There is then an expected lull until further winds between 12pm and 3pm. From that point onwards, it will be breezy until the end of Sunday, 9 February. Our Eastern network may experience some coastal gusts of 60mph but because the winds are heading from the south-west, the risk is significantly reduced. Extra resources, including linesmen, scouts and call centre staff, have been mobilised for both the Eastern and South Eastern network areas. UK Power Networks' specially trained staff, known as Customer Champions, have been put on stand-by. We are currently assessing the need for raising the number of jointers in case of higher than usual numbers of underground faults as a result of potentially heavy rainfall. You are viewing the February 2014 archive.